A Tropical Paradise just above Water. Famous for its 1,200 tropical islands, snow-white beaches, swaying palm trees and richly coloured coral reefs, the Maldives has become a tourist paradise. This island nation, officially called the Republic of Maldives, consists of 22 atolls with many small islands scattered in circles. It stretches almost 1,000 kilometres from north to south in the Indian Ocean, south-west of the Indian subcontinent. 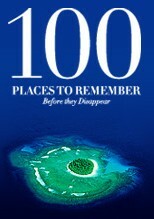 Only 198 of the islands are permanently inhabited, although many others have been developed into tourist resorts. For the 360,000 inhabitants, tourism has become the biggest industry, accounting for almost 30% of national income and more than 60% of foreign currency. With 80% of the country less than one metre above sea level, climate change poses a serious threat to the Maldives, especially since almost all of the human settlements, vital infrastructure and industries are located in close proximity to the coast. In the last 15 years, the sea level in the ocean surrounding the Maldives has risen by 4.5 cm. Estimates suggest a further rise of 20-60 cm by the end of the century. The area could also see an increase in the intensity of tropical storms. This would threaten both the tourist industry and the Republic of Maldives as a nation. The Maldives was the first country in the world to sign the Kyoto Protocol.